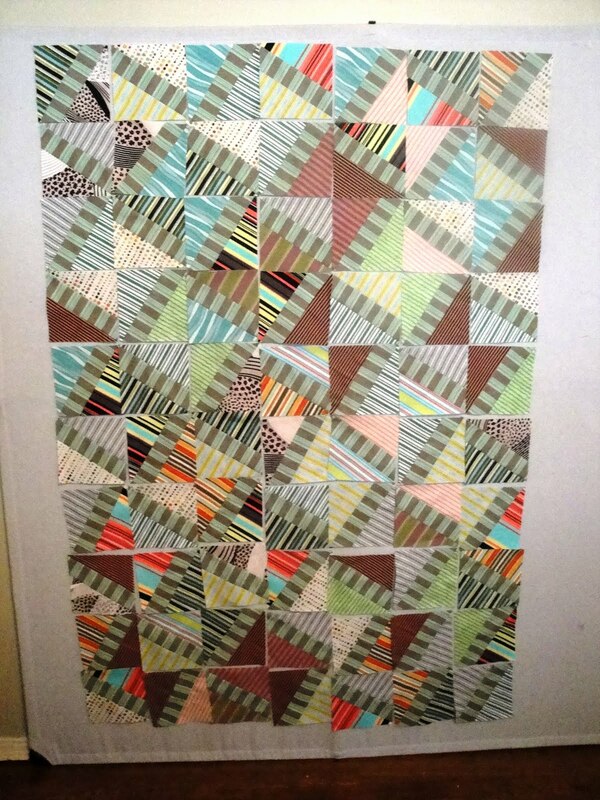 I am finished, done, completely through with this quilt. 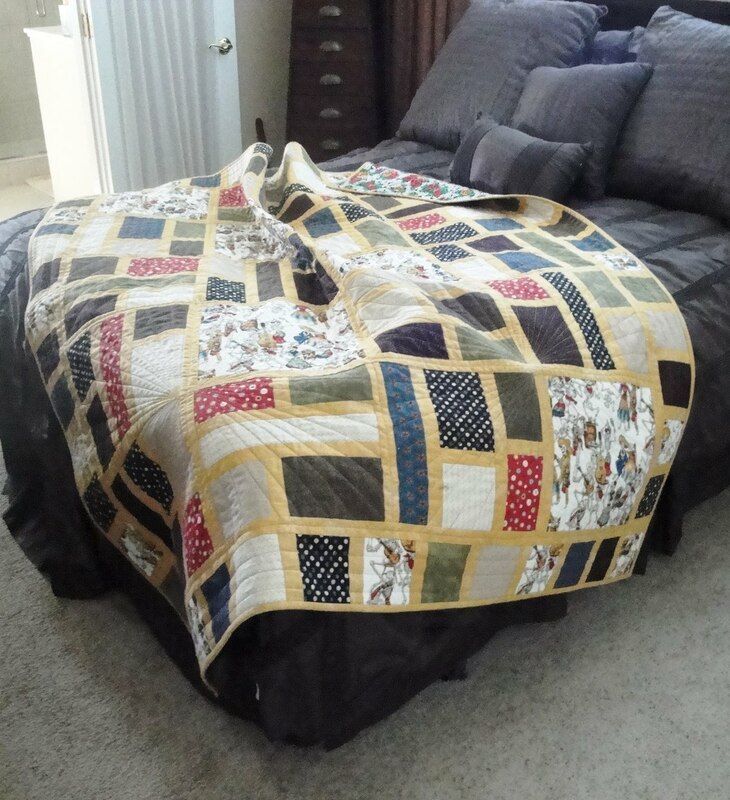 Oh, I still have to wash it and sew on a label. 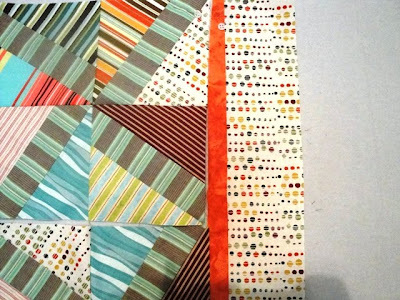 But, other than that . . . . on to the next project. Think I better get back to Lyn Brown's mystery. Isn't her final clue us up today? And, I haven't finished the last clue. I'm quilting today. 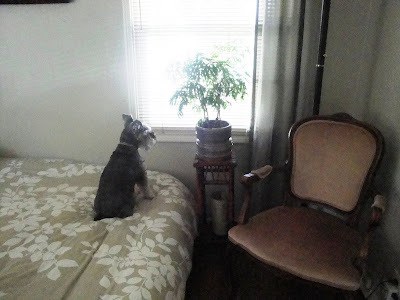 Poor Trudy must spend her day looking out the guest-room window. What do you think? Is she hoping to see a cat? 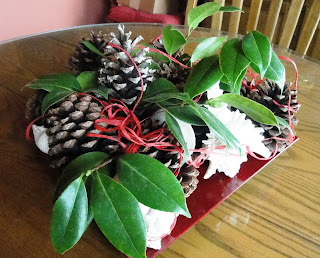 Amanda has a Christmas challenge going and for August we are to make a table centerpiece. 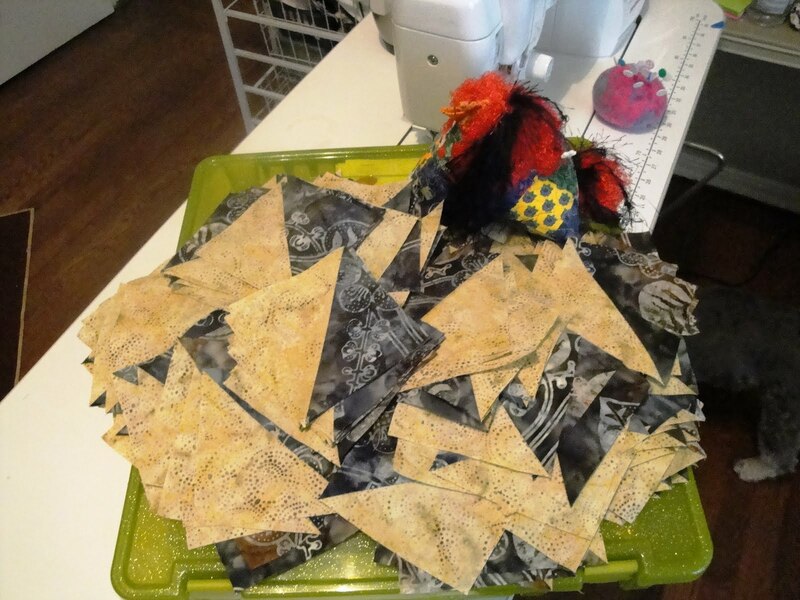 I should have sewn something. I could have. But instead, I decided on seashells and pine cones. It is too early in the year to be able to find some spruce or pine sprigs, so, I am using some leaves from my Camellia bush. Well just try to find something better right now in Southern California. Or at least in my backyard. I had the seashells and my daughter sent me the pine cones from Florida. Seems they have some on their property. The red is some raffia strewn about for color. I'll use Christmas greenery come December. Just a sneak peek of the new quilt. I do like it so far. The gold-colored sashing almost gives it a warm glow. The pattern I have been using is City Blocks by Kari Nichols for Mountainpeek Creations. 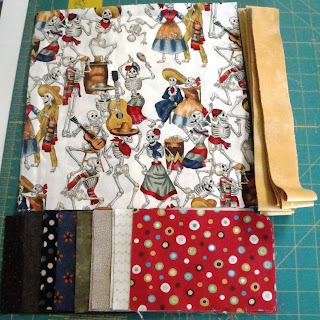 I am running out of fabric and will have to get creative with the border. Is that what is called a design opportunity? My step daughter Janet in Idaho, wants a Day of the Dead quilt. This may not be familiar with some of you and not everyone's cup of tea. 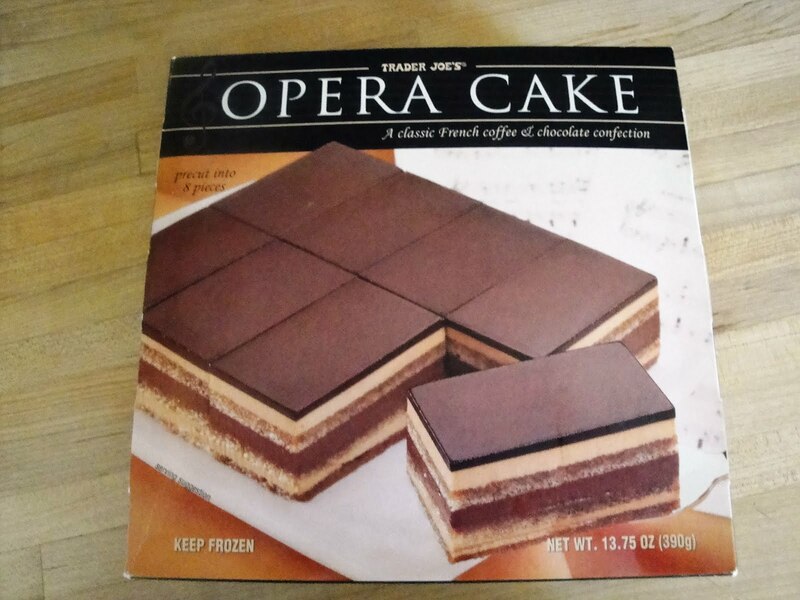 I will tell you it will fit into Janet's house beautifully. 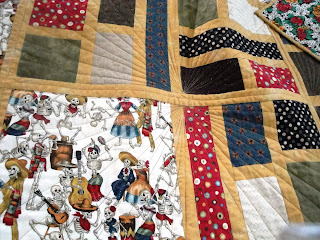 Day of the Dead is most popular in Mexico and a time for celebrating and honoring the dead; not meant to be morbid. It is already cut and partially pieced. I should have more on this tomorrow. Done is good. It did seem to take forever to just decide on the border. And, as busy as it is, I like it. 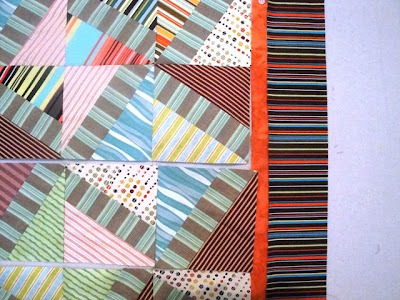 This is a challenge that Beth put out on her blog. Go here to see. 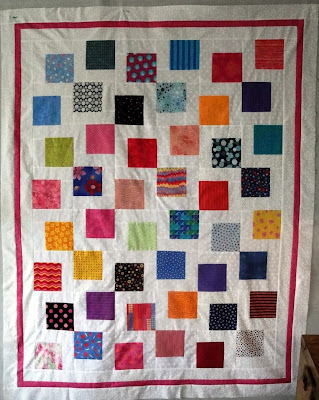 I used the X Block, by Patricia Pepe, to make the center blocks. 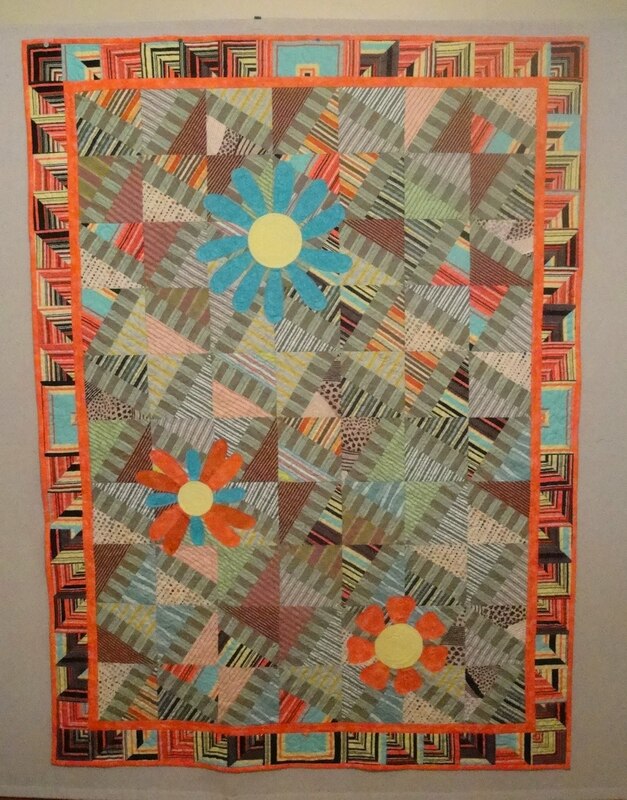 A blend of Bamboo, Silk and Cotton by Quilter's Dream was used for th batting. By the way, it was very nice to work with. 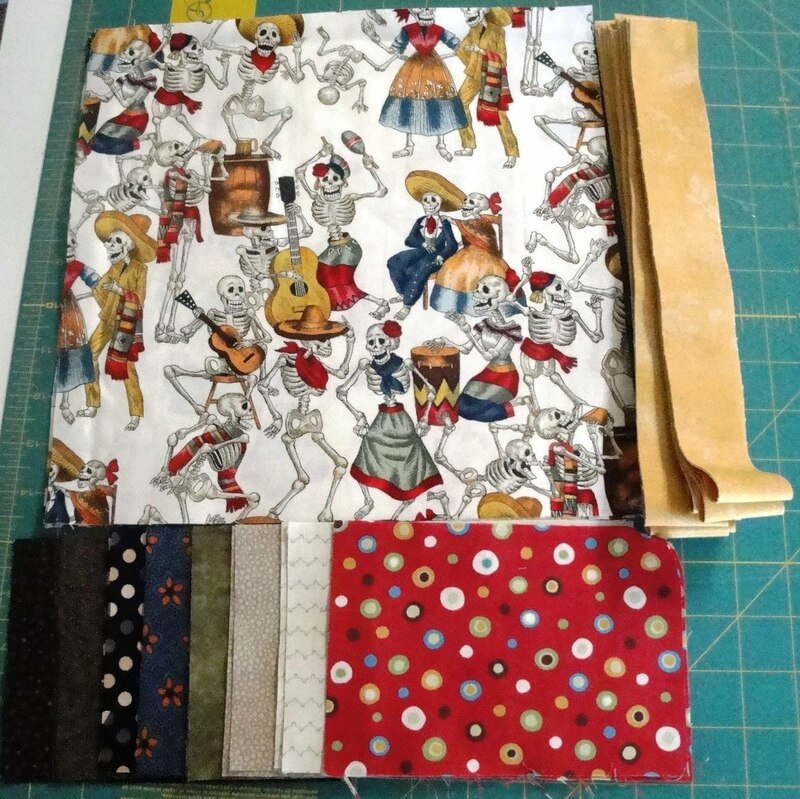 I chose a backing of dark brown with lots of flower power. Which brings me to the name: Flower Power. 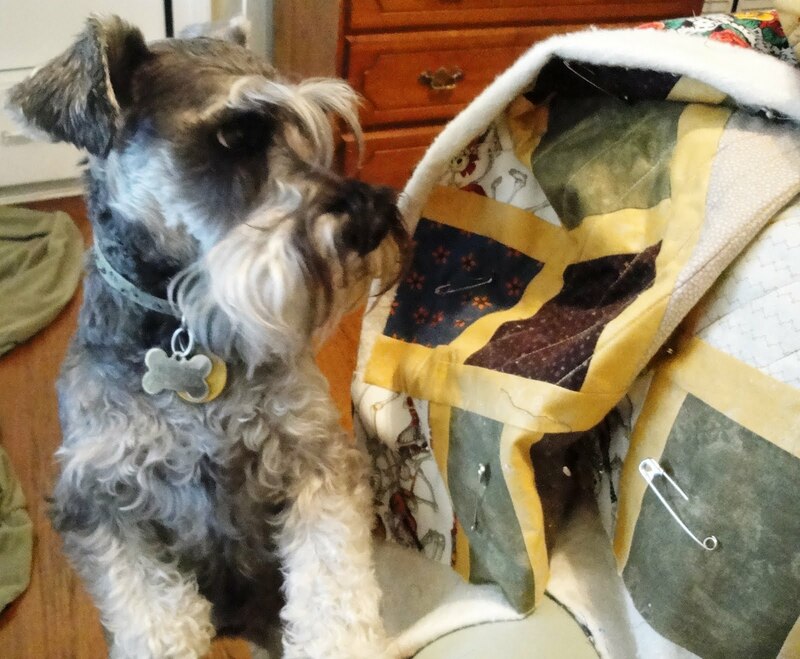 And as you can see, it is Trudy tested and approved. 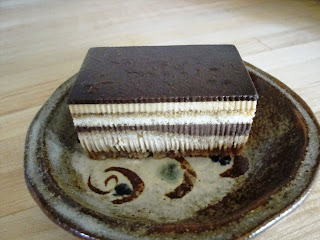 Have you ever had Opera Cake? You can get it at Trader Joe's. And it is VERY good! 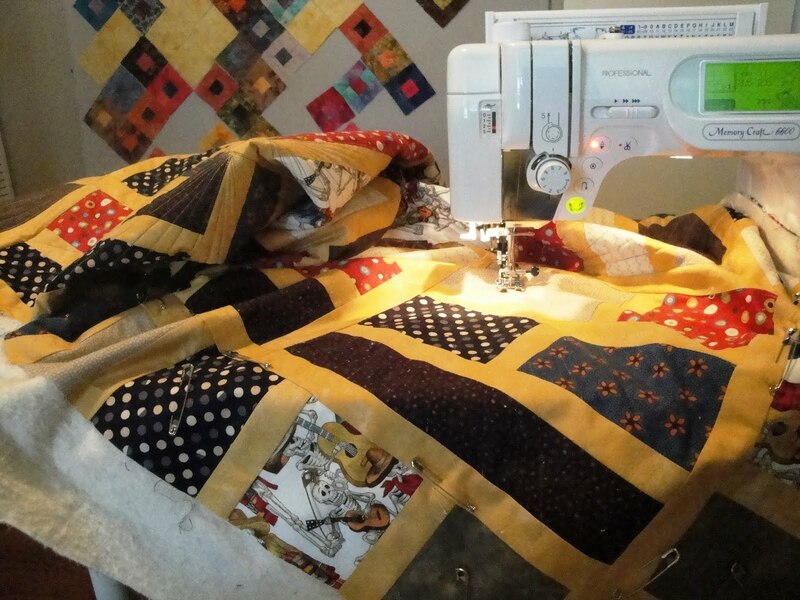 Sew Cal Gal is hosting a Pets On Quilts Show from August 7th through August 21st. It really is a fun event. To learn more about it and how to enter yourself, go here. Here is my entry for the Pets On Quilts Show. 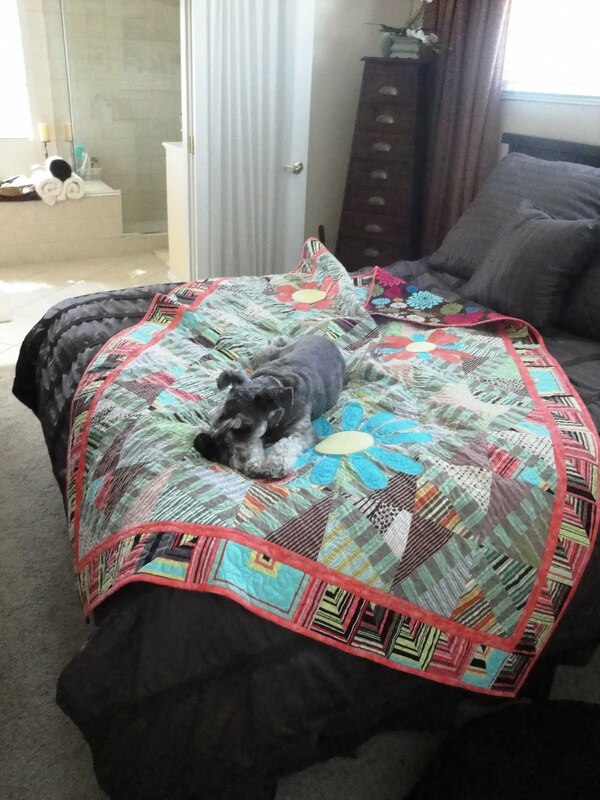 This is my Schnauzer, Trudy. 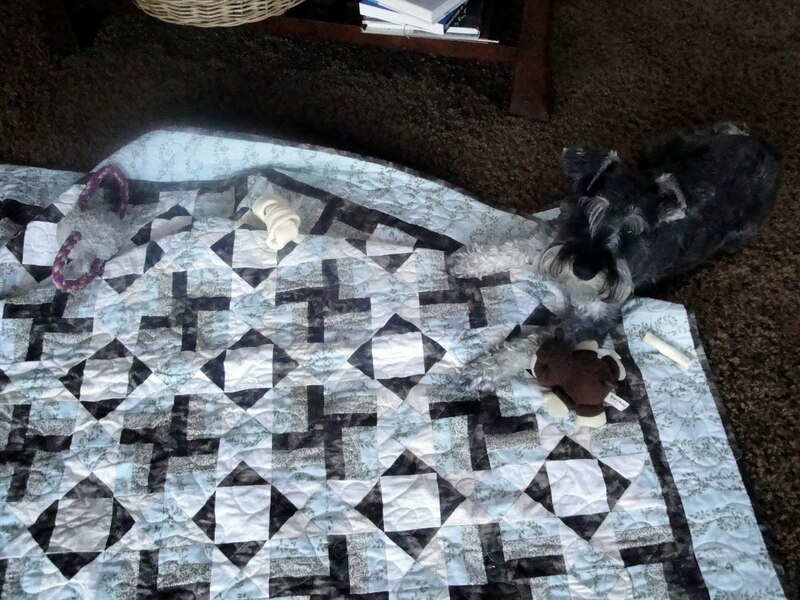 Not only does she like to lie on the quilts, she places all her favorite toys and chewies on the quit. 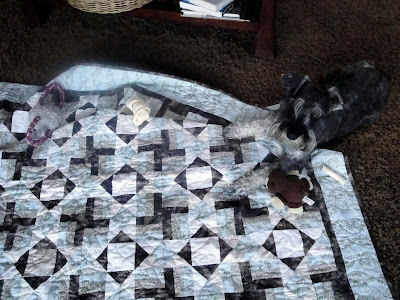 There is her lambie, her rawhide bone, her monkey and another rawhide stick. One never knows what may happen to thing if they are not properly guarded. The quilt was an exercise that my friendship group did. 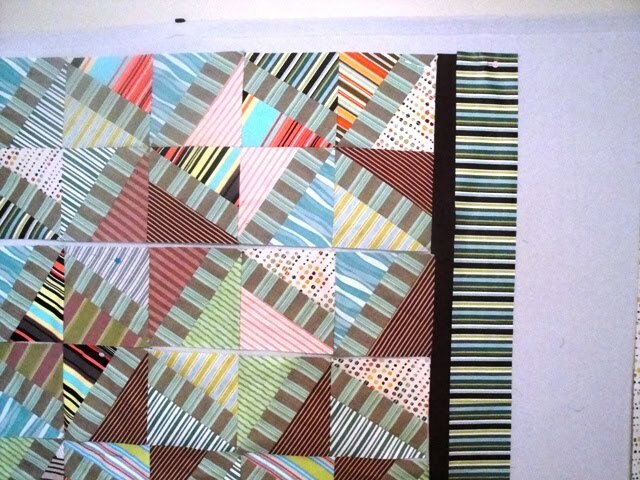 Quite a while ago, Quilter's Home talked about using paint chip family colors to create a quilt. So, Robin grabbed a handful of color families, turned them upside down and had everyone choose one. Actually, this wasn't my pick. I think Patti picked it and declared she didn't think she could do it using that color choice. So, I traded with her. After all, our group is called Wednesday Wackos. I did add the dark brown because the colors were on the bland side. And I think the dark brown makes it all work. 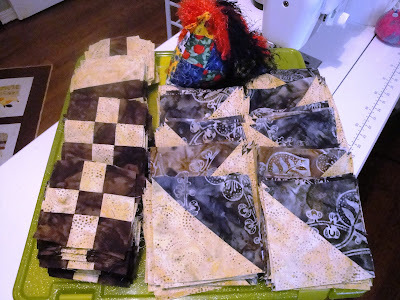 I took it over to Terri's, another member of the Wednesday Wackos, to quilt on her long arm and she named it Sterling. I'm not sure why. But, Sterling it is. Trudy and Sterling look good together, don't you think? 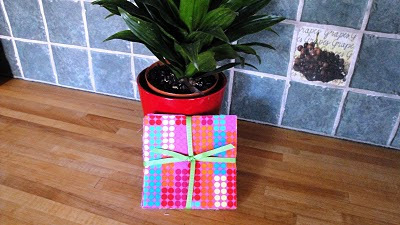 Clue 3 of Lyn Brown's Puddle Jumping Mystery is half-square triangles. 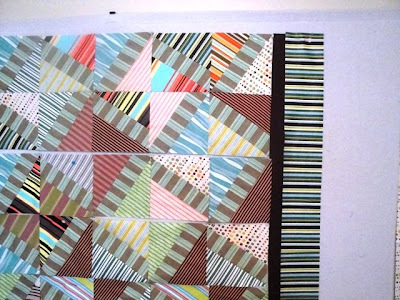 For the larger size, it is 240 half-square triangles. It took me a couple of days to finish these. Here is a picture of the three clues we have done. 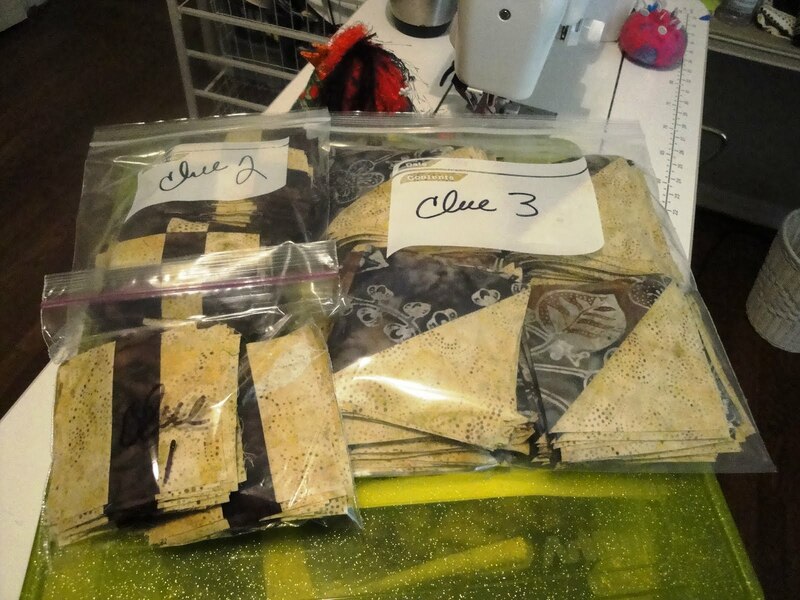 Clue one is the rail fence; clue two is the nine patch and then the 240 HSTs. 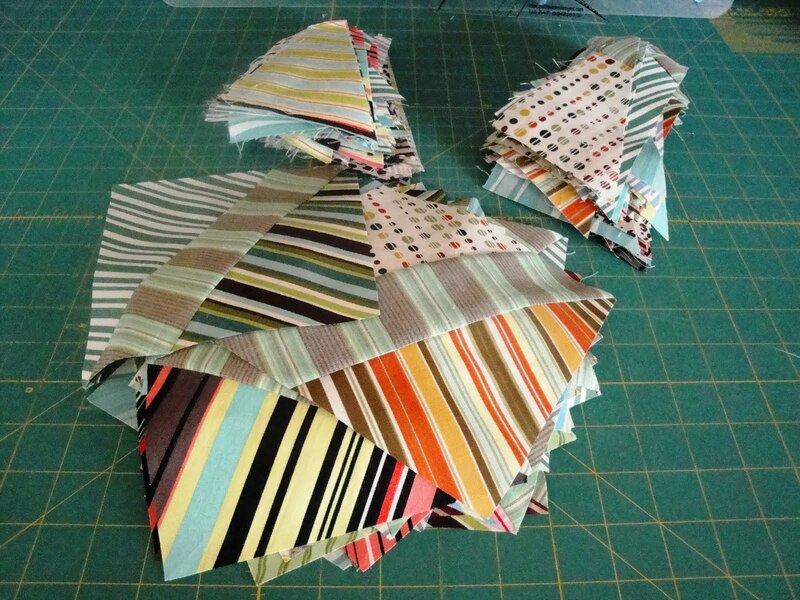 That is a LOT of HSTs. But, they are bagged and ready for clue 4 on August 17. Bring it! Back in April I won a giveaway from http://starbound-studios.blogspot.com/. 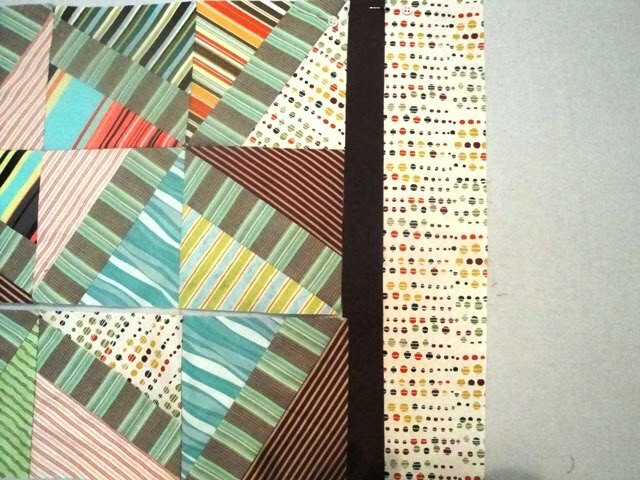 All spots and dots and stripes. 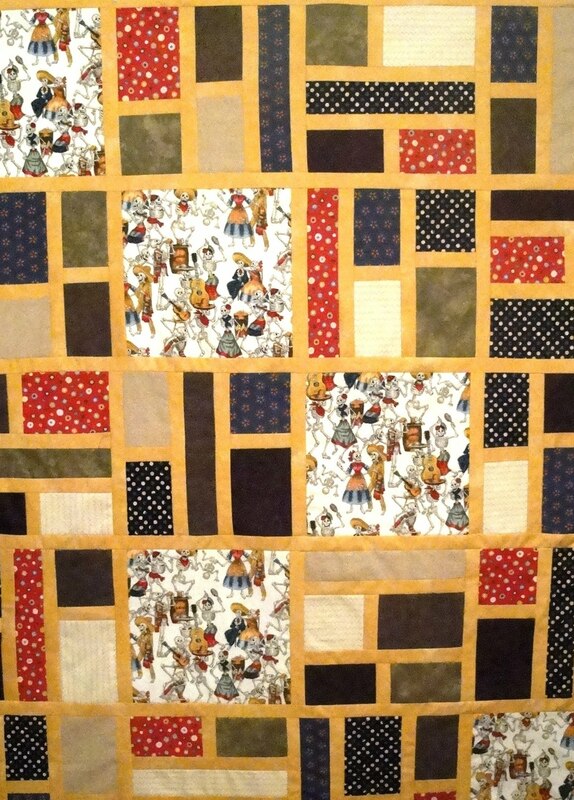 Robin told me about a baby quilt she has been working on that took 48 charms to make. My spots and dots charm pack had 44. 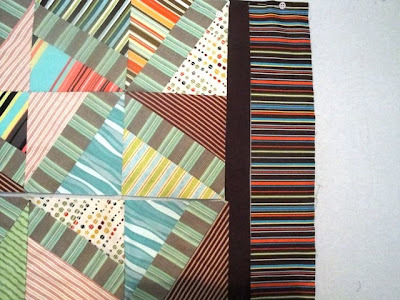 How easy to find four more to add to make this cute quilt for new baby Gwen. 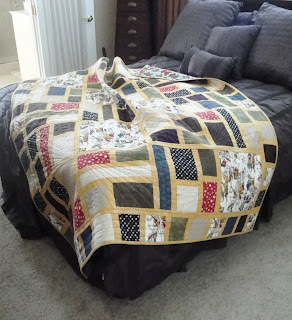 I quilted Gwen's Quilt while on a retreat in July. However, it was this week before the binding got sewn and the quilt sent off to Gwen. I hear she has it now. Mind you, Gwen and her parents live in Chandler, Arizona. 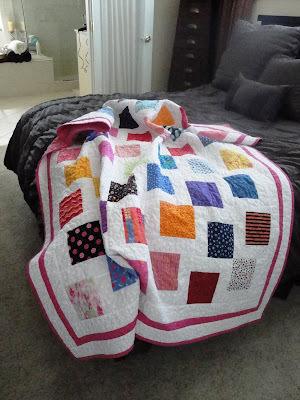 Not exactly quilt weather. So, she can sit on it for now. Maybe come January, when it is known to actually get chilly in Arizona, Gwen can cuddle in it. This and the next two inner borders are dark brown. You can really over think this if you are not careful. 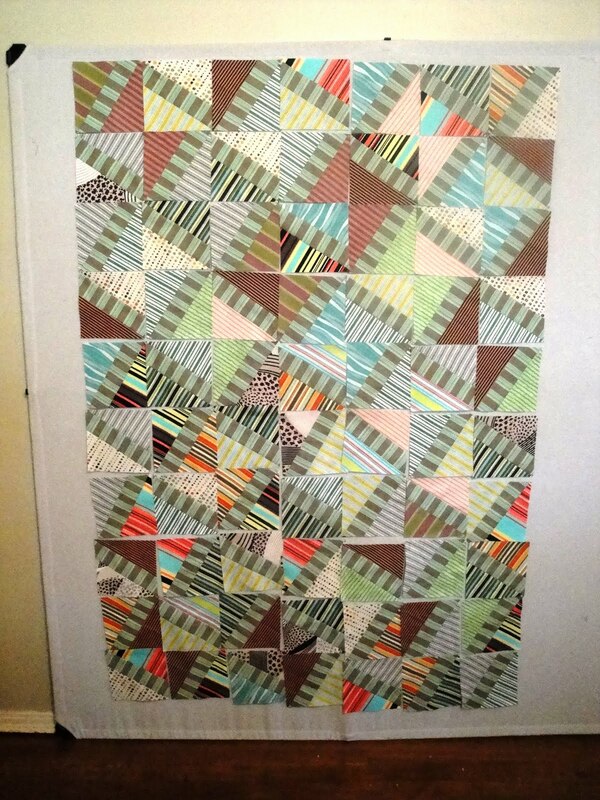 Thinking a coral-colored inner border would be nice. Wouldn't you think I would have something that would work? Tomorrow it will off to pick up a piece of bright coral for the inner border. In the meantime, I'll just start putting this together as is. 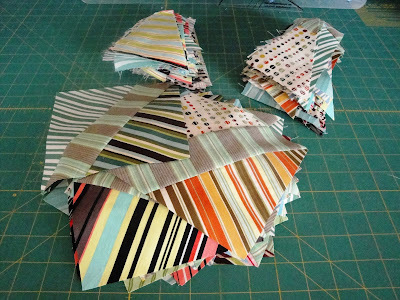 Lots of bias edges, lots of spray starch used, and lots of cutting with the X-Block.